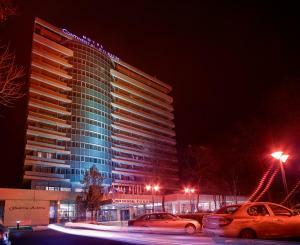 Hotel Iris is situated in Arad near Reconcilierii Square and the historical centre. It offers accommodation with air conditioning, cable TV and free Wi-Fi internet access. There are 2 restaurants with a terrace serving local and international cuisine. The Iris provides a supervised parking area. The City Hall is 1.7 km, Arad International Aiport is 2 km and the Train Station is 2.2 km away. When would you like to stay at Hotel Iris ? Air-conditioned rooms with free Wi-Fi and cable TV. Each day we'll check prices and send you an email for your selected dates at Hotel Iris. If you don't have specific dates but would like to check prices for say next weekend or say next month we can check the price too. Click to write a review and share your experience of Hotel Iris with other travellers.